Mirza Taghi Khan Amir Nezam, generally known as Amir Kabir, was one of the greatest statesmen Iran ever had: a brilliant man who was far ahead of his fellow countrymen of the time. He fought injustice, and unreasonable favors and wealth thrown on the princes and other men at the king's court. He was a man who believed in meritocracy and lost his life in his efforts towards this cause. Within the short period he acted as Nassereddin Shah's (1833-1899, ruled 1850-1899) Prime Minister he did a great deal for his country and made tremendous effort to modernize his nation and introduce them to the ways of modern world and the achievements of the West. Among his greatest services to Iran was the establishment of Darolfonoon (The House of Technologies) in 1853. Scholars, past and present, all maintain that Darolfonoon played a vital role in the emergence of the Constitutional Movement among the educated people of Iran. This school was especially intended to produce engineers and artists/craftsmen that Iran lacked and that had brought about a staggering development in the West. This was 152 years ago. In 1888 another brilliant chapter was opened in the history of education in Iran. A group of American missionaries came to Iran and established a school in which modern teaching techniques were used. 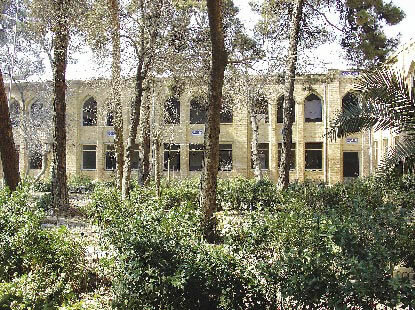 This school gradually grew to become Iran's most important center of education next to Darolfonoon. This was 117 year ago. The above are two turning points in the history of education in Iran: two centers of education that played decisive roles in the modernization of Iran. This school was established in an excellent building specially designed and built for the purpose. Teachers were invited from Europe mainly Austria and students were taught in just the same way as young people were taught in the West. The construction work was supervised by Mohammad Taghi Khan, the official state architect. The construction of the school was begun in 1850 and was completed in 1853. It consisted of a central courtyard surrounded by 50 classes each 17 sq m in area and offices, a theatre, a printing-house (one large room), a library, a dining room, and workshops and labs. About one month after the day the construction of this school had begun Amir Kabir sent a capable man, John Davood (David), to Austria to invite a number of teachers to educate young Iranians at Darolfonoon, for a period of six years. The subjects taught comprised: infantry techniques, artillery, geometry, mining, logic, and medicine (surgery and anatomy). Later the number of teachers was increased to cover the subjects of cavalry, pharmacy, physics, and chemistry. The budget foreseen for this venture amounted to 5,000 toomans, equivalent to 2,500 pounds sterling, a year. It is extremely sad to note that when Davood returned to Tehran with some of the teachers, Amir had been deposed from his office just two days earlier. However, eight months before two teachers had arrived from Austria and military training had already begun in the fields. In addition to these foreign teachers there were also many Iranian teachers, people who had been educated in Europe. Finally, the school was officially inaugurated by the young Nassereddin Shah, just 13 days before Amir Kabir was executed. The best possible facilities such as books and lab equipment were brought from Europe and put at the disposal of the students. The school's printing-house produced excellent publications and books. Above the printing-house (on the 1st floor) was the official state photographic studio. The school's budget increased to 3,875 pounds sterling in the first year and by 1889 to 15,000. Lord Curzon, The British Ambassador to Tehran who later became the British Secretary of Foreign Affairs, arrived in Iran in 1889. In his notes he points out that in 1889 the number of students at Darolfonoon was 387 of whom 75 students were engaged in military studies and training, 140 in science and technology, 45 in learning the French language, 37 in English, 10 in Russian and 80 in technical drawing and building techniques. Darolfonoon expanded rapidly and Nassereddin Shah made serious attempt at developing it; perhaps to make up for his great mistake of killing the Amir. During the Pahlavi dynasty, when schools emerged one after another, and education became available to all, later even compulsory, Darolfonoon lost much of its importance and ultimately became a secondary school. The history of the present Alborz College begins with a primary school that was established by a group of American missionaries who arrived in Iran in 1871. They built this school in 1873 in southwest of present day Tehran. 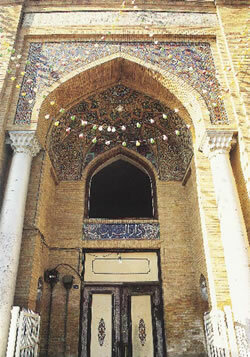 In 1885 they began the construction of another building which was inaugurated by Nassereddin Shah himself. In 1898, the famous Dr Jordan arrived in Iran and took charge of the school. Later, in 1924, the construction of a building was commenced at the site of the present day Alborz College by funds that an American benefactor donated. 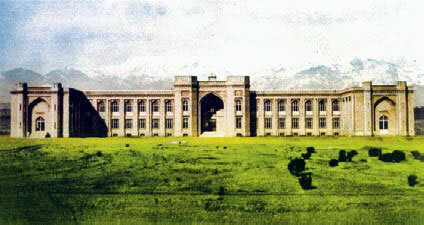 This modern school was transferred to the Iranian Ministry of Culture in 1940 and was given the name of Alborz College. Dr Jordan did a great deal for the Iranian youth and thus for the whole nation. He was greatly admired and loved by his students, so much so that many of them thought of him as their spiritual father. Alborz selected outstanding students from among the best families or the most brilliant students. Until just before the Islamic Revolution you had to be a singular student with exceptionally high marks (19 out of 20) to find your way into Alborz. But after the Revolution, Alborz fell out of favour, parts of it were taken away from it and given to the Faculty of Arts, Amir Kabir University etc. However, what remains as Alborz High School is still the largest high school of the entire country and still of the highest standard. This year is the 80th anniversary of the establishment of Alborz Secondary School or the American College from its first day when it began as a school at the present site. A celebration was held on the occasion and all the great men that had worked as teachers and administrators in this school during the 80 years, were remembered and honoured. But, today both Darolfonoon and Alborz have declined in the roles they played as two important centers of education. In many other countries these two schools would be held in honour and would be kept well maintained; but in our country people do not seem to value the significance of these two schools! This article is written to remind our people of the important roles these two schools played by educating some of Iran's most outstanding statesmen, poets, painters, engineers; and to ask the nation, the authorities in particular, to treat them as they truly deserve.